2P START! Live! : Jessica at the Olympics Edition | 2P START! The end is near now…the end of your RELATIONSHIP! Jk. This was not your best podcast (a bit drawn out), but I agree on the Mario and Sonic (babe) criticism. 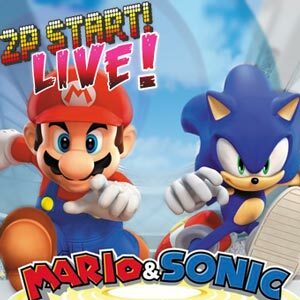 Mario and Sonic finally go head to head, and it is a complete flop. Oh, and I am a girl by the way, in case you ever quote me again. (Maybe I should change my gravatar to something more girly?) Ciao for now. Narnian, I did correct Ray and Jessica because I remembered you were a girl (you can hear me say ‘she’ at 25:22). I agree that this probably wasn’t our best podcast. We found it a bit difficult to stay focused with a third person on (not Jessica’s fault, just different for us). I’ll admit though it was a fun one to make! The jingle is from Mario Kart: Double Dash, when you get less than 3rd place at the end of a race. At the beginning i was like “RAY’S DATING JESSICA CHOBOT!!!!! OMG WTF ROFL!!!! !” But anyway, this was one of your greatest podcats yet, and Jessica will always be a welcome to any podcats as far as i’m concerned. Buuuut Jessica should be ashamed, wtf is K-Soft? And how the heck was “Sonic Riders” and “Shadow the Hedgehog” the first two Sonic games to come to mind(3D or not)? I would’ve guessed Sonic Adventure 2(which I did before it was said) 😀 . And I think I’ll hold off on olympic games until they release “Mario and Sonic at the Mobius Olympics”. I know what the Chime is!!! From Triva for You, the Chime is the race lost music from Mario Kart 64 for the Nintendo 64!!! The music at the very end is also from Paper Mario TYD. Chime is indeed from Mario Kart: Double Dash!! after getting anything lower than 3rd place. yeah, it was in Double Dash, but it was in Mario Kart 64 first. In that game, if you got a place lower than 4th, you “lost” (and this music played) and you had to do the race over. Oh well, it was nice to have Jessica actually doing something in the podcast. I love how every time someone said “edit”, the part they wanted edited still ended up in the podcast (although maybe there were more edited out). The chime is from Mario Kart Double Dash when you finish a race. gosh, everybody got this chime. the chime is from mario kart: double dash. you hear it when the race is over and times, stats, and other things are being displayed on the screen after you place lower than 4th place. you also hear it when you don’t beat any time trial scores. the only reason I knew about it was because I was listening to this podcast and playing the game at the same time and when I heard that Jessica was licking psp’s I couldn’t really concentrate. jk. was the song from the 120 to 12 podcast from kid icarus?